With: Ed Bear, Narwalz of Sound (Brian Blomerth), MV Carbon, Ogg Myst (G Lucas Crane and Alaina Stamatis), Luke DuBois, Wolfgang Gil, Ben Owen, Nat Roe, Margaret Schedel, Millions (David Suss), and Arturo Vidich. Last summer many of us saw NASA’s data visualizations of a rapidly melting ice sheet in the Arctic. At just about that time REVERSE artist Melissa F. Clarke went on an expedition to the arctic to gather material for a new series of work. From June 7th to 9th Clarke will bring to REVERSE a special weekend publication launch of her multimedia work and a preview of the installation Sila: results of that month long expedition up the coast of Greenland towards the northern most reaches of the Earth. For the first two nights Clarke has invited artists to create and perform work based on concepts relating to nature and natural identity, inner outer experiential landscapes in a digital mediated age, and other ideas that are part of her practice as an interdisciplinary artist working with data, media, and our understanding of landscape and nature. On Sunday afternoon the artist herself will perform sounds gathered from the Arctic and Greenland, as well as sonified data, and a screening of the accompanying video work. Originally from Syracuse, NY, and having recently returned from the Arctic, Melissa F. Clarke is a Brooklyn, NY based interdisciplinary artist that has substantial experience with ice and glacially carved terrain. Often using data combined with other content, Clarke makes multimedia installations containing sound, video, and interactive art. Melissa also creates still images and multimedia design projects. Clarke creates her own custom hardware and software for her work and works with scientists, engineers and programmers as part of her process. 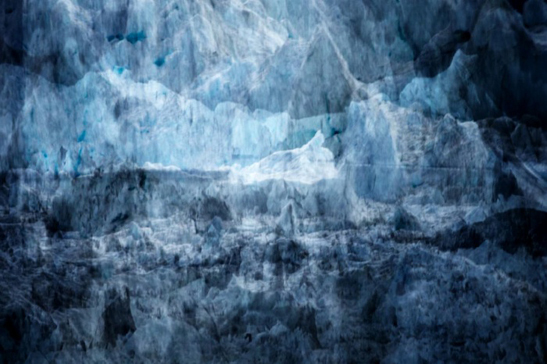 She worked with Geophysicist Dr. Frank Nitsche, Associate Research Scientist of the Earth Institute of Columbia Universities’ LDEO, in creating her series: Untitled Antarctica. With that recent project about the other, southern pole, Clarke endeavored to reconnect seismic data collected from beneath the Antarctic seas with its more organic source. Using sound, video projection, wood, and glass sculpture, she created an immersive neolandscape, giving physical form to the information collected about the giant landmass and the terrain beneath the seas surrounding it. Melissa has exhibited with: Eastern Bloc, Montreal CA, 319 Scholes, NY, Eyebeam, NY, Issue Project Room, NY, with the Queens Museum, NY, the Electronic Music Foundation, and the International Biennial of Contemporary Art ULA-2010, Venezuela. Her work has been featured by the Creators Project and with the Village Voice, Kickstarter, Art 21, and Columbia University’s State of the Planet. Clarke received her masters from New York University’s Interactive Telecommunications Program, with a two-year Tisch School of the Arts Fellowship. MV Carbon is a Brooklyn based interdisciplinary artist. Her work combines cello, analog synthesis, magnetic tape, field recordings, hand-built circuitry, and sound installation. Her performances stretch beyond standard methods of musical execution while subjectivity seeps to the forefront. MV Carbon’s performance will build off of the imagination and input of the participants. Voice, strings, magnetic tape, and circuitry are combined in an effort to melt away melodic expectations while congealing a gathered intention. A dialog is sculpted through tape loops and selective circuitry. The intention that is formed will be delivered to the core of the earth where it will bake to a delicacy. Ogg Myst (G Lucas Crane + Alaina Stamatis) is a collaboration between unspeakable data formats and unfashionable CD-ROM graphic adventure video game s, featuring audio-collage artist G Lucas Crane and narrative performer Alaina Stamatis. For Earth Flat, Ogg Myst will explore the gratifying life change that accompanies the melting of an important layer permafrost. Gil’s aesthetic will investigate the physical correlation between sound, space, and audience. More specifically, he is interested in the transformation of sound as a direct consequence of architecture and how this phenomenon can be used to enrich the audience’s sonic experience. Margaret Schedel is a composer and cellist specializing in the creation and performance of ferociously interactive media. She contributed a chapter to the Cambridge Companion to Electronic Music and she is a joint author of Electronic Music. Currently she is working on an issue of Organised Sound on sonification. As an Assistant Professor of Music at Stony Brook University, she serves as Co-Director of Computer Music and is a core faculty member of cDACT and focuses on gesture in music, and the sustainability of technology in art. Using the recordings of the endangered bowhead whales, and interviews with hunters in greenland about climate change, Schedel creates a cello duet with the recordings controlled and manipulated by a sensor bow. David Suss is the sole party behind Millions, and his dense overpowering take on the peaks and valleys of drone in his solo project. Suss has tuned his project Millions into a cosmic channel since 2006, sculpting a brilliant body of work across labels like Tape Drift, Blackest Rainbow, Peasant Magik, and 2:00AM Tapes. Millions engages each unfolding second with a composer’s patient and subtle touch. Millions (David Suss) will feature manipulated and processed field recordings speaking to the theme of nature and re-creation (and manipulation) of physical phenomena. Arturo Vidich has developed a holistic performance practice that concretizes unreliable memories into workable art materials. By guiding his impulsive behavior into creative pursuits, the materials and formatting of his work can shift depending on the project at hand. His work has been presented primarily in New York for the last 10 years. Vidich will use emotive telepathy to choose candidates that match parts of his authentic self. These candidates will be embroiled in a performed activity that develops through improvisation, interference, and ritualized gestures.